Denver Public Works won’t be building standard sidewalks on Walnut Street any time soon, but while we’re waiting for a permanent, concrete pedestrian surface, crews have started installing what amounts to a parking-protected walking lane on segments of the speedy one-way street in River North. These low-cost “sidewalks” define space for pedestrians with curb stops (low concrete barriers), creating a walking path along the fast-developing strip between Broadway and Downing Street. The project is not complete yet, and may not finish until mid-September, project manager Michael Koslow said. It’s good as a quick-and-dirty short-term fix, but it’s clearly no substitute for the real deal. 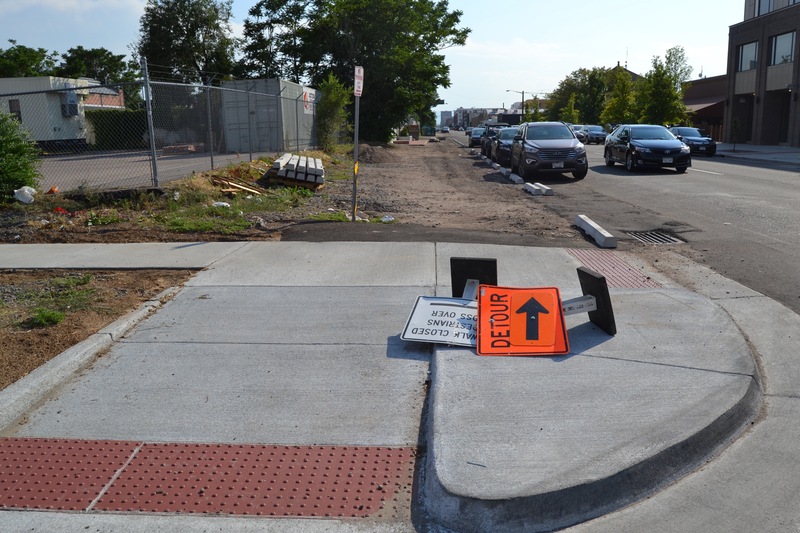 Crews have installed concrete curb ramps on the corners as well, and there’s a world of difference between the quality of those surfaces and the uneven asphalt, gravel, and dirt along the makeshift path, which will be especially troublesome for people in wheelchairs. As parcels are developed, builders will have to construct eight-foot sidewalks by their properties. 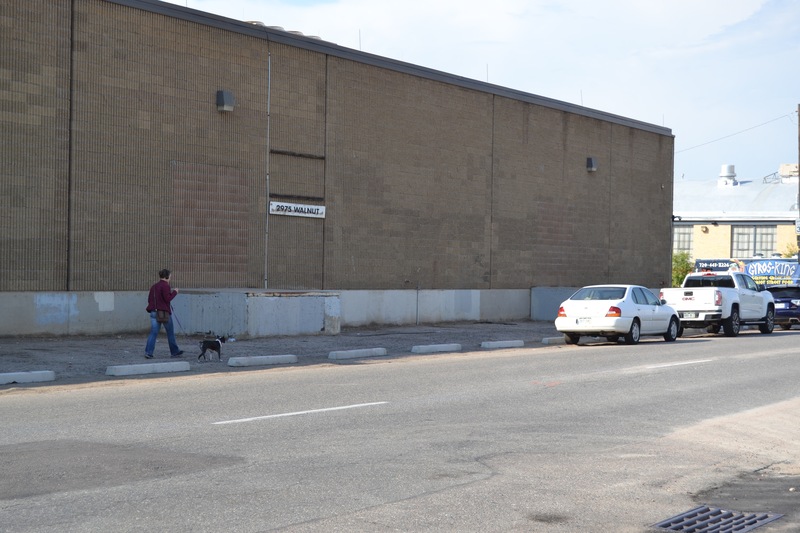 Then in 2019, when Walnut is slated to become a two-way street (as long as funding is secured), the city says it will fill in any remaining sidewalk gaps. I’m hoping the use of concrete curb stops will become the default for protected bike lanes and projects like this instead of the plastic bollards. These are much more effective and less ugly. The bollards are clearly less effective though, cars are constantly in the lanes where they are used. Curbs are plenty visible, plus an actual physical barrier to driving your car where you’re not supposed to. Planters are really great, even more of a buffer between people and traffic, making the whole street more pleasant for everyone. I hope they start using those too! Why aren’t the curb ramps bulb-outs? You’re already doing the work, making them bulb-outs will just add a bit of extra time and concrete but make walking so much better for decades to come.